Algarve, Portugal, has made its name as one of the most popular beach resorts to flock to since the 60’s, the southernmost strip’s sandy coastline capturing the hearts of travellers year after year - and with over 150 stunning beaches, it's no surprise. Our list of Algarve holiday deals mean you can indulge in fun for the whole family wherever you decide to stay, from leader of the pack Albufeira to Lagos, Praia Da Rocha and Vilamoura. Get carried away with an abundance of things to see and do in the Algarve, from its exceptional diving to world-class golf courses, ancient-old harbours and excellent dining scene. Plan a fun day out with the kids at Zoo Marine, go mountain biking along the ochre clifftops or check out some of the laid-back fishing villages for a taste of traditional Portugal. For more must-see's, take a look at our top 8 things to do in Algarve. If you’re looking for a magical summer holiday for family in 2018, Florida is just the ticket. Crowned as the theme park capital of the world, Florida boasts famous attractions at Walt Disney World, Universal Orlando, SeaWorld and Animal Kingdom, so you'll be spoilt for choice when it comes to entertainment for the whole family. Mickey Mouse and Cinderella's Castle are not all you can expect to find on your travels though, since the Sunshine State is also known for its fabulous beaches and year-round temperatures. The Gulf Coast is dotted with gorgeous sands including Cocoa Beach, St Pete Beach, Fort Myers and Clearwater, plus unmatchable shopping malls, lush golf courses and a pulsating nightlife. 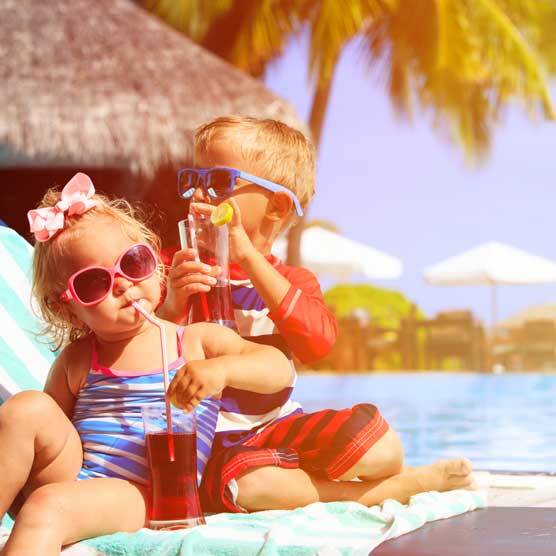 Browse our top family hotels in Florida for fantastic deals. Included in our list of resorts for best family holidays for summer 2018 is Benidorm, Spain, a Brit-loving hotspot in Costa Blanca offering family-friendly fun under the sun. The palm-lined promenade of Levante is the hub for lively travellers to enjoy exciting watersports and bustling beach bars. Those who are looking for something a little quieter can stroll along Poniente beach or soak up the sun on the sheltered Malpas beach. Despite being a popular party place, Benidorm holidays capture authentic Spanish culture dating back to the 1300s. Walk down the old town’s winding cobbled streets and explore historical buildings, baroque churches, fascinating art galleries and museums. Entertainment is everywhere in this exciting family-friendly resort with visitors of all ages enjoying the lively nightclubs. Experience the tasty tapas bars and listen to the tribute bands in Levante to mark the end of a glorious summer holiday. Benidorm is undoubtedly one of the best family resorts of 2018 and is just a short flight away. Situated on the East Coast, Puerto Del Carmen is the longest, largest and busiest resort on the island of Lanzarote. With a pleasant year-round climate and plenty of opportunities for family-friendly fun, Puerto Del Carmen richly deserves to be on our list of top family holiday destinations for 2018. The resort boasts 6km of sandy beaches, all excellent for sun-worshipping, swimming and watersports. Originally a quaint fishing village, the old town of the resort is now a picturesque port filled with spectacular small eating joints, serving fine wine and seafood. If you consider yourself more of a night owl, Puerto Del Carmen’s new town is the perfect place to let your hair down. Why not visit Centro Atlantico for a host of lively pubs, clubs and bars? Whatever you do, Puerto Del Carmen is a great choice if you want beaches and bars in equal measure. Take a look at the top 5 hotels in Lanzarote for more on family holidays. Go on an adventure trail! This sun-soaked resort on the southwest coast of Turkey is backed by beautiful mountains and boasts one of the most famous beaches in the world. Sink your toes into the mile-long stretch of Blue Flag beach which leads up to a spectacular lagoon, where you can paddle in the sea, potter along the lively promenade and dine in one of the delicious waterfront restaurants nearby. In Olu Deniz, you’ll find a plethora of activities from hiking and biking to mountain excursions and more – so don’t forget your walking boots. If you want to sample a different kind of vibe, the neighbouring resort Fethiye is just a 25-minute drive away and comes complete with a buzzing marina and plenty of scope for evening entertainment. For natural beauty and a warm atmosphere, the resorts of Olu Deniz and Fethiye should surely sit at the top of your bucket list of best holidays for families in 2018. The Riviera Maya is a beautiful stretch of crystal-white sands on the Caribbean coastline of Mexico’s Yucatán Peninsula. This resort, which is known for its beautiful beaches and all inclusive resorts, is a great place for family holidays. The resort offers over 30km of pristine white sands and calm shallow waters which are ideal for watersports – be sure to go snorkeling and scuba diving in the world’s second biggest reef, the Great Maya Reef. More of Mexico’s natural attractions can be found in one of its four eco parks, where you can swim with dolphins, raft in underground rivers and explore the country’s culture in more detail. Venture off the beaten track, and get to know Mexico’s traditional villages or travel to the archaeological site at Tulum and explore the cryptic Mayan ruins. Once a quiet stretch on the east coast of Fuerteventura, Costa Caleta has emerged today as one of the best family resorts. The island’s stunning beach is situated around a sheltered, horseshoe-shaped bay with plenty of beachfront shops, cafés and sandy sunspots. Costa Caleta caters well for families, and with a multitude of all inclusive and last minute holiday deals to choose from, you’ll soon be lapping up the best of this Mediterranean destination. When you’re not soaking on the sands, it’s just a 15-minute drive to the capital, Puerto del Rosario. Take a day trip and see if you can spot the capital’s quirky sculptures or get some good deals in the Las Rotondas shopping centre. Extend your excursion by 40 minutes and visit the Dunas de Corralejo National Park, where you can embrace the desert beauty of Fuerteventura. Paphos is the gem of Western Cyprus. The 150m beach is both pocket-sized and picturesque and the medieval castle sitting just across the turquoise waters is hard to miss. Split into both a sandy shore and wooden decking, Paphos beach leaves you spoilt for choice in terms of sunbathing spots. Coral Bay is just a 10-minute drive up the coast where you’ll find a selection of seaside watersports, rustic taverns, cafes and cocktail bars. The Tombs of the Kings and the Temple of Aphrodite are examples of the breathtaking archaeological attractions that grace the island, and the kids can learn a little bit of history too. Give your loved ones one of the best family holidays for 2018 summer by taking them to the magical beach resort of Paphos. Indulge in some real watersports! If you’re looking for fun family holidays, you can’t go wrong with the Balearics. Set on the north coast of Majorca, Alcudia resort has a bundle of attractions to suit every holidaymaker. From Blue Flag beaches to waterparks and beautiful coves with safe, sheltered shallows, Majorca has it all. The clear and calm waters are popular with snorkelers, while the island’s Roman ruins and historic old town add a shot of culture. The capital Palma de Mallorca has plenty of picturesque landmarks. Stroll down the impressive Passeig des Born promenade, overlooking the city from the well-preserved 14th century Castell de Bellver, and visit the spectacular Le Seu Cathedral, which lies in the oldest part of the city. Check out the best family resorts in Majorca for fun under the Mediterranean sun!